Comment on nothing94's Naruto Volume 46 Cover. Nobody complained about the magazines to be uploaded, so i devided to upload my new Manga Cover (for the competition), which is technically a boxart. Rest made by myself :D!!! Please explain to me how this is a box. It looks very much like a book to me. And it's not game related, unlike the magazines. #2 its technically a boxart. nobody complained about barrack pop. 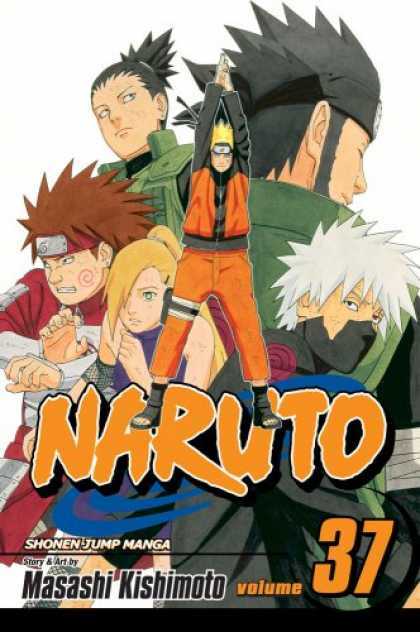 The logo should be over Naruto's legs. but the reason nobody complained about my barack pop, was because it was tecnically a box art. But anything that covers a product is a box art IMO Fav! #7 I googled Manga 37 but I don't know exactly what I'm looking for. how is it technically a box art? and it has nothing to do with games either. I will however, admit this is well designed. I just don't feel it belongs on the site. #11, first of all, i accept your opinion, thanks for the compliment. But i would like to know: what is a box for you? For me it is a well designed "box" (:p), which means it has a cover with wallpapers, renders, a logo, and effects, ratings and a dev logo, and maybe a spine and a back. I'm getting tired of people eschewing anything but box art. Here's my opinion, nice, but I wish it was higher in quality. looks excellent, very official looking... in fact, almost too official. I almost bouhgt 44 (45 will be released in july, 46 in december), so many money spent for these books... the series will be finished with volume 54. Dammmmm the seperation from the west and east version.. love it! fav! F***. I wanted to use this idea. very nice I don't care whether its a box or not I am glad you uploaded it I always like your designs. Its not as good as your other naruto design but thats going to be quite hard to beat. Well done Could you do me a favor and try doing a Batman AA box I would like to see your take on that. #12, however logical your explaination is, if you showed this to anyone, they would recognise it as a book design, not a box. It may have all the components of a box design, but the outcome is a book cover. the Japanese version looks great btw. For those that need to be told TWICE... Do not message me to look at your work. I have no interest in this. I couldn't care less if it wasn't a boxart, because it's well designed. yeah, i agree with you. Everybody would have seen this as a book design, but are the music cd covers a box or a cd design ;)? Wow! Thats a nice box! Fav, 5/5. I don't know if theres any mistakes because I don't read it but this is nicely put together! Very nice, it's kinda blurry, but I'll fav. Let's see, there's one, two, three, four, five, six sides. Looks like a box to me. Slip covers seem rather unnecessary for a book, and the glare on it is a bit too harsh, but other than that I don't see any blatant flaws. Nice job. Maybe i will add a german version in a few days. Yeah, this is pretty good. I mean, I think Naruto's feet could be under his logo, but there's not much to complain about. I'm not a fan of Naruto so I couldn't comment on the source images and stuff, but I do have some manga volumes [Beet the Vandel Buster, Inuyasha, FMA, Sailor Moon...] so I know what they generally look like. I agree with #15 on its 'official' look, but agree with everyone else that I couldn't see this as a game box art, but it could definitely pose for a DVD or Manga cover to me! wow, nice new update! love the multi-region idea! I love how you have 3 versions up. Do you have all of them? 13,000 views? Damn, that's a lot. Exec: 0.27165914 © 2004-2016 VGBoxArt.com. All rights reserved. Crafted in San Francisco by Reed.